MOD Description: Yesterday Facebook is lifting the curtain on its big new comments platform , This MOD will simply add this platform to phpBB3 system. Whenever you leave a comment on a phpBB Forum that’s using Facebook comments, you’ll see a checkbox asking if you’d like to also post that comment to Facebook. Leave it checked (it is by default), and your comment will be posted on your Facebook Wall and in your friends’ News Feeds. at 26 march 2011 adding the number of comment below the topic title . Q1 : What this help for ? A1 : Let’s say I leave a comment on phpBBegypt and opt to have that comment shared to Facebook, too. Then, if one of my Facebook friends comes along and leaves a comment on Facebook about my comment, their comment will be posted back to phpBBegypt( see the next image ). 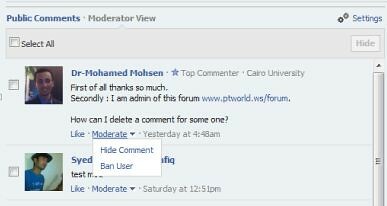 In other words, any discussion that my comment sparks between my Facebook friends will be seen on phpBBegypt as well. That’s very powerful, and it’s something that nobody else can do. Q2 : Can i moderate this comments ? it should (check the screenshot below) .. are you fill your app id ? It should appear in both , forum and facebook tools , are you add the meta tag as it is at the mod file ?